I can't help but compare Keith Giffen's Doom Patrol: We Who Are about to Die, his first trade of the series, to Bill Willingham and Matt Sturges' first Justice Society outing in The Bad Seed. Both are fresh starts for the titles, and the Justice Society story is passably good (and I hear the next volume is better). Giffen's Doom Patrol, however, is so edgy, so dynamic, and takes such great pains to acknowledge existing DC Comics history while forging new ground, as to put other such premieres completely to shame. Giffen's Doom Patrol seems to me the direct descendant of Judd Winick's late Outsiders series (even though historically the former predates the latter), and not just because artist Matthew Clark drew the heck out of both. The members of Giffen's Doom Patrol are wonderfully dysfunctional, as Winick's Outsiders were; when a member of their team dies, they're barely able to feel bad about it, though they hate themselves later for their lack of emotion. Each is being obviously, even blithely manipulated by the "Chief" Niles Caulder, whose indifference to the Doom Patrol's emotional and physical well-being is simultaneously disturbing and riveting. 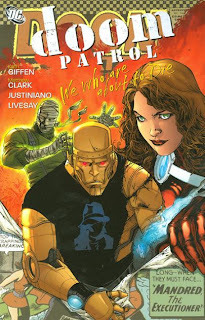 The real achievement of Giffen's Doom Patrol is to cut through all the chaff that's hung on this team over many years, and get right to the wheat -- the core, easily recognized group of four: Robotman, Elasti-Woman, Negative Man, and the Chief. Like the Tony Bedard/Dan Didio Outsiders series (in team, not in quality), reducing the Doom Patrol to the original members heightens the emotional quality of the story; these heroes don't care much if they live or die themselves, but they've known each other a long time and care about each other, and they becomes relatable to the reader in that way. Of course, what's old is new again, too. Giffen only actually gets to pit the Doom Patrol against one enemy, and then an enemy that becomes an ally, before Blackest Night intrudes (well-illustrated by Justiniano); what we find in this volume, however, is that the Doom Patrol is now the police force for the mad scientist nation of Oolong Island, which became sovereign in 52 Aftermath: The Four Horsemen. Not only does this work to put the Doom Patrol just slightly on the wrong side of the law -- sometimes their goal is to save the experiment, not the scientist -- it also gives Giffen plenty of opportunity to introduce the trademark Doom Patrol weirdness, like their aforementioned fight with a human-bug hybrid and a living black hole. The moral grayness of the Doom Patrol's missions also reminds me of Winick's Outsiders, and nicely differentiates Doom Patrol from other superhero teams. After three introductory issues and the two-part Blackest Night crossover, Giffen's piece de resistance in the book is his final one-issue focus on Negative Man. I'll admit I didn't even understand all that Giffen reveals about Negative Man in this issue, so steeped is it all in long-time Doom Patrol lore, but what Giffen does accomplish (and what an accomplishment it is) is to tie together and make valid all the disparate incarnations of the Doom Patrol over the years -- from the original Arnold Drake incarnation to Grant Morrison's Vertigo series, John Arcudi and even John Byrne's "imaginary" series (Matthew Clark does fantastic impressions in this sequence of Byrne and of artist Tan Eng Huat). If ever a team's history did not make sense, it was Doom Patrol's, and I love the way Giffen acknowledges and even makes more relevant your favorite incarnation, like Geoff Johns did with the Legion of Super-Heroes in Final Crisis: Legion of Three Worlds. What this first volume of Doom Patrol accomplished for me, read right after Justice Society: The Bad Seed, was to remind me what good comics are. I liked Bad Seed, but I found the plot rather uninspired, whereas Doom Patrol had me surprised and interested and excited, rooting for the characters and cringing at their self-inflicted wounds. Giffen presents both the characters and the weirdness you'd expect from a Doom Patrol title, but with a sense of menace and moral uncertainty that raises the title well beyond just heroes fighting villains. I'm so impressed by Doom Patrol: We Who Are about to Die, I'm willing to say this: Doom Patrol is the best series I wasn't reading, and now I am. You should be, too. All of this, and there's a trailer page at the end for the next Doom Patrol volume! I can't necessarily credit Giffen with that specifically, but how nice to see an advertisement for a series' next trade inside the volume before it. This is an acknowledgment, overdue I'd say, that if a reader is holding one trade in their hand, there's good reason to believe they might be looking for the next one. Rather than a publisher banking on all comics fans watching the interwebs to know when the next book comes out, it seems to me an in-volume affirmation that "yes, there will be another volume" should be standard practice; this is just one more reason this Doom Patrol volume left me very pleased with comics. I've never read anything Doom Patrol-related, would I be totally confused reading through this? It sounds like you have to have read the previous runs to really be able to enjoy this. If you're not familiar with the Doom Patrol, there might be a couple of moments that make you shrug (not to mention that the current Doom Patrol fights assorted old members of the Doom Patrol in the Blackest Night chapters). However, I think the final chapter does do a pretty good job summing up the Doom Patrol's history overall -- even if Negative Man's narration is (purposefully) confusing at times, with changes in perspective and tense. What I'd ask is, did you like Judd Winick's Outsiders? Doom Patrol is edgy like that -- not as violent as Secret Six, but it's got a definite dark undertone, plus definite science-fiction weirdness (bug people, black-hole people), if you like that kind of thing. And I think the art by Matthew Clark and Justiniano is flawless throughout. So those are the arguments for it, continuity aside, and then you'd have to go from there. I was completely enamored with this volume too, enjoying it much more than I expected to. Second volume wasn't quite as good, but I'm completely hooked on seeing where it goes. Glad to see a third trade is planned given DC's habit of dumping lower sellers from collected status. Maybe the Secret Six crossover will create a sales bump. Even though you don't have to read the earlier versions, you're not going to be sorry if you do. I suggest sampling Morrison's second collection "The Painting That Ate Paris" for a proper exposure to the best of his run. I doubt the Secret Six crossover will save this book or even help it. Secret Six is a relatively popular mid list book, but I don't think it's the kind that's really got the kind of power to save what's essentially a struggling book. I was actually kind of shocked this book was even made, because after all the failed attempts past Morrison to make it work again, common sense would assume one would kind of give up on it. I've thought that, if DC wants it to succeed, the best bet would probably be to hand the Doom Patrol over to Vertigo, perhaps in exchange for one of the characters Vertigo claimed dominion over from DC. There are a couple reasons such a move might be a good one. Oh finally. I have been waiting for a review of one of my favourite books. I just ordered this last night on Amazon (with the second volume, after they offered a discount for getting both). I'll let y'all know what I think when they get here. I admit to a little skepticism, partly because the Morrison run was so delectably oddball that it's difficult to imagine anything topping that. But then, I say that about every property Morrison's touched. As much as I enjoyed this trade, here's hoping DC gives this series its due and collects all the issues, even though it's now unfortunately canceled. I know what you mean, Aalok. There's something about Giffen's dialogue that really puts me off. It's like he tries too hard to make every line cute, to the detriment of clarity. It doesn't have the poetic, yet natural quality of Azzarello's equally obtuse dialogue either. This is interesting -- I did find that Giffen's Booster Gold: Past Imperfect was "too cute," like some of the slower issues of JLI, but I thought Doom Patrol has had a nice balance (and I adored Doom Patrol: Brotherhood). Will be interested to hear if you all feel the same about Giffen's upcoming DC Relaunch Superman.